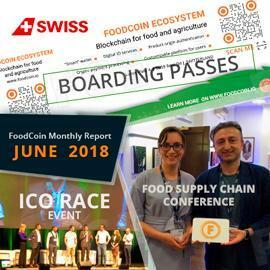 The founder of FoodCoin Ecosystem Gregory Arzumanian visited ICO Race event, which took place in June, 7 in Lugano, Switzerland. The most interesting part of the event was a competition part with the Highest Prize Ever: 1 Million Dollars + Listing on one of the TOP 3 Exchanges in the world. During this event, the project obtained promising contacts and new partnerships among influential cryptoexperts. In June 12, FoodCoin Team also visited Food Supply Chain Conference in London with such great guests as McDonald’s, Nando’s, Nestlé, Pernod Ricard, Westons Cider & Many More. The main topics were modernization of food supply chains and new technologies related to reducing costs were subjects of discussion. FoodCoin Team met with representatives of the largest food producers and discussed the possibility of implementing Ecosystem in their current food supply chains. FoodCoin Team keeps working with current partners. We are proud to announce that our promotion partner Swiss Airlines will start promotion campaign. In November, FoodCoin videospots will be shown in all flights from Singapore. In addition, FoodCoin logo will be printed on boarding passes for flights from Zurich. Added support of FoodCoin, as well as other ERC20 tokens. So far, the wallet allows adding/removing tokens, sending tokens, viewing details about transactions, etc. * Instant transaction system, Guarantors’ behavior, smart contract for Guarantor’s warranty fund management. * Testing of instant transactions system for private networks was launched. * Several accomplishments in Payment system development, such as implementation of the API engine and the core. * Minor improvements in FoodScan functionality. A couple of updates for FoodCoin Wallet: Implementing support of two-level mining and account restore. Improvements and testing of FoodCoin Blockchain. Also, it is planned to improve instant transaction system and Guarantors' behavior. As for the payment system, it is planned to add support of ETH and BTC. FoodCoin Blockchain is also going to be developed in accordance with GDPR Law (Verifiers). Smart contracts are planned to support order tracking system. Of course, FoodCoin Team will keep working on new tasty features in the upcoming month. FoodCoin Ecosystem has also a new Advisor Andrei Uspenskiy, CEO of Arnest Group, successful manager and expert in large business management. Before joining Arnest, he was CEO of Uralsib Asset Management and Board Member of Uralsib Bank, as well as several other large businesses in Russia in different spheres, from confectionary to automotive manufacture. Useful things are better with nice appeal. So meet our talented designer. Andrii Muzhytskyi has 3 years of experience developing web portals and mobile applications, applying UI and UX. He uses the software products from Adobe Ps, Ai, Xd, Sketch. Also he took part in the development of applications for OS Windows, Mac, IOS, Android. Besides the team, FoodCoin community is is getting larger as well. New farmers and producers are also joining the system and the community. There are already farmers accepting FoodCoin on 1000ecofarms. You can buy products on 100Ecofarms now! To make this process easier, we are going to publish the manual. To attract more farmers to accepting FOOD for their products, participate in our referral system. Thank you for being with us! Stay tuned.